Not everyone agrees that paying attention to the details can actually be fun. But for a reader, it’s the details that can make or break and story. And for a writer, it’s the details that can sometimes be the most entertaining part of writing. And when my dad read The Puppeteer, he sent me an email that went something like this “You reference tin foil as a method for disrupting the underwater security system of the drug lord. They stopped using tin in ‘tin’ foil in the early 1900s. Now it’s all aluminum.” Thanks, dad. Seriously. We may still call it tin foil, but it’s not and it’s a detail that some readers, readers with more knowledge of manufacturing history than I, might pick up on. So why do the details really matter? As a writer, they’re a fun excuse to do some research; I learned more about the CIA and international economics in the past year than in four years of college. But my edification isn’t why the details really matter. They really matter because no writer wants a reader pausing in the middle of a scene and thinking, “That’s not right.” So yes, the devil is in the details. And while getting the details right may slow us down, or make us change our stories if, at the end of the day, at the end of the story, you close the cover (or turn off the electronic device) and think, wow, that was fun, the devil may not be so bad. Very interesting article. I enjoy research,too. And you're so right about getting the facts correct. Now the Puppeteer is going on my TBR list. Indeed, excellent points. Even after almost three decades of law enforcement experience I still do ride-alongs with other agencies, to see what little things they do differently. I know very little about law enforcement but my next book has quite a bit of procedure in it and I had a BLAST spending time with a friend of mine who is a detective learning how to clear a room, all about gun holsters, and state gun laws...way more fun than it should be! I am constantly amazed at the research that writers do to produce great books. My purpose for reading is to escape, I do not analyze the details and in the end hope that I enjoyed a really great story. 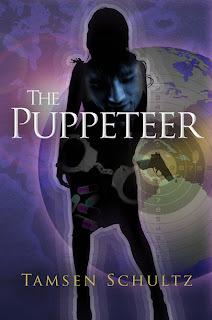 Going to add Puppeteer to my TBR list also and look forward to your next book Tamsen!